Springtime brings warm weather, beautiful flowers, and… homeschool conventions! There are few better ways to be inspired, encouraged, and invigorated along the journey of homeschooling than attending a homeschool convention. It is an opportunity to be surrounded by like-minded people, attend informative workshops, see lots of new curricula, and receive wisdom and encouragement from experts and veteran home educators. Homeschool conventions can open your eyes like never before to innovative ideas (milling your own wheat, anyone? ), educational techniques, amazing resources, and to the culture of homeschooling itself; dispelling the all-too-prevalent feeling of being alone and overwhelmed by the responsibility of home education. “Eye-opening”, “informative”, “uplifting”, and even “life-changing” are just a few of the descriptions I’ve heard participants give about their convention experiences. The not-so-good news is that homeschool conventions can be completely and utterly overwhelming. There are generally many more workshops and resources available than time to spend attending and seeing. Without some practice and support, it can be easy to spend money on convention admission, hotel, meals, and parking – only to depart with what I like to call the “homeschool convention daze”. Hundreds of workshops and seminars, thousands of people, hundreds of thousands of resources – it’s enough to make the first-time convention attendee feel like a hiker lost in the middle of a national forest full of hiking trails, without a map. But never fear, homeschool hikers! Just follow these homeschool convention survival tips, and you’ll be navigating the convention trail like a pro! Go with a friend who has attended before. This is one of the best ways to get the most out of a convention. A homeschooler who has previously participated will have inside knowledge of how to best navigate the event, capitalize on workshops and keynote speakers, and the most advantageous ways to spend your time. She will also have a “layout of the land” and be able to help you more efficiently get to the places you want to go within the timeframes you have available. Plus, it can be incredibly helpful and encouraging to have someone with which to discuss all you have seen and learned, and you can save money by sharing a hotel! Determine your priorities and monitor your time. Plan your schedule ahead of time. Know what you want to accomplish from your time at the convention. Do you want to learn some creative ideas from other homeschoolers? Are you needing to be inspired, encouraged, or informed? Then focus most of your time on workshops and keynote speeches. Is your goal to peruse curricula and get an idea of what you might want to use in the future? Do you plan on buying materials for the upcoming year? Then put the priority on spending time at the curriculum fair. Decide on what is most important to you, and monitor your time accordingly. Homeschool conventions have so many more things to see and do than you have time to see and do them, so planning ahead (especially by previewing convention schedule literature) will help you to make the most of the time you have and accomplish your goals. Choose which workshops and speakers you will hear before you attend. Many conventions provide a schedule of events or list of seminars online prior to the convention itself. By downloading and printing this list ahead of time, you can decide which workshops are most interesting to you, and prioritize how you plan to spend your time. It is not uncommon for multiple workshops to be held during each allotted workshop timeframe (making it essential to prioritize which ones you like the best), so having prepared ahead of time which one you want to attend can save you tremendous time. Create a list of what resources you need to purchase. 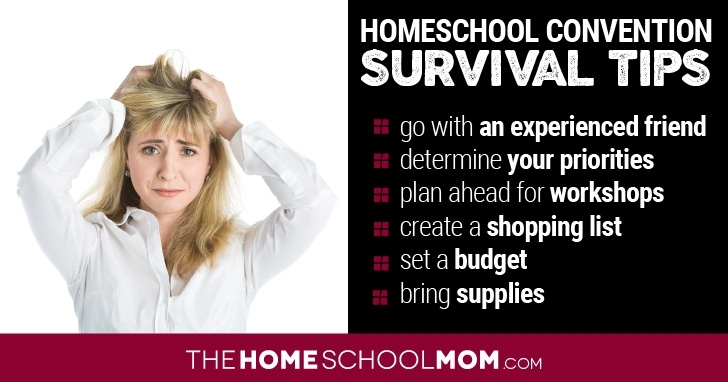 The sheer number of resources at homeschool conventions can be staggering and overwhelming. Many a convention attendee has experienced the post-convention “There’s no way I can possibly use all of this stuff this year” fallout that occurs from becoming overzealous at the table of a gourmet buffet of homeschool materials. While conventions can give you great ideas, it is best to be armed ahead of time with a foundation of resources that you know you need for your home school, so that you do not buy more than you can actually use. For example, if you know you need a Science curriculum for this upcoming year, as well as something to help with writing practice, make these the basis by which you set your purchasing budget. Go online and check out the list of vendors that will be present at your convention, so you have an idea of the materials that will be available (and, if you’re really hard-core, where those vendors are located so you can quickly get to the ones in which you are interested). Then create a “wish list” of other resources you’d be interested in purchasing, so that after you have acquired your needed resources, you have some flexibility if (um, when) you find other materials at the convention that you want. Set a budget for what you will spend, stick to it, and bring that amount in cash. It is very easy to impulse buy at conventions, simply due to the sheer number of resources available. Before you are tempted by the incredible array of books, CDs, science kits, and software programs, be sure you set a reasonable budget for what you will spend. Plan on bringing that budgeted amount in cash, so that you can easily keep track of what you are spending, know when you’ve spent it all, and are less likely to go over your budget. Budget a reasonable amount for the “must have” resources on your list (looking online can give you an idea of prices), and then also include a budgeted amount for your “wish list” – those amazing materials that you find at the convention that you didn’t even know existed! Bring a rolling cart or large suitcase. Pro homeschooling conventioners know that as fun as it is to buy all of those awesome resources, it’s not so fun to lug them all around for the rest of the day! Maintain the freedom to purchase what you need, keep together all of the information you learn from workshops, and still be able to get out of bed the next morning by purchasing a collapsible rolling cart or bringing a large suitcase with a telescoping handle. Bring a three-ring binder full of paper, and a hole punch. Set up sections in the binder for each workshop or seminar you attend, with plenty of paper in each section for your notes. Bring a hole punch with you to the convention, and punch holes in any workshop materials you acquire, putting them in the appropriate section. In this way, all of your notes, seminar materials, and vendor informational flyers/packets can be kept together and organized in one place, so they will be useful to you when you get home. There is nothing more frustrating than attending a great workshop on tips for helping your ADHD son focus, only to return home and realize the information from it got lost amidst all of the other materials you obtained. Keeping flyers and informational brochures from vendor booths in this binder can also help you access resources you want to use in the future, but may not have the ability to purchase right now. Want more guidance? Check out my homeschool convention insider tips where I expand on this topic. If you find yourself overwhelmed after the homeschool convention is over from all of the wonderful resources and ideas, check out my tips for dealing with Post Homeschool Convention Stress Disorder. TheHomeSchoolMom’s local homeschooling resource database will help you find homeschool conventions and events in your area. I’m attempting this school year to homeschool my 7 year old ASPERGERS grandson which we raise. I am new to homeschooling and need all the help I can get. We are currently on Time 4 Learning. Where do I find social activities for him? Hi Susan – You can look for homeschool support groups in your area which often have activities like field trips and park days. You can also try to find a good fit with groups like 4-H, scouting, sports classes (karate, gymnastics, etc. ), little league, and more. If you are in a rural area, those things may be harder to come by, but if you are in a suburban area you may have to do a little more work, possibly even planning your own get togethers. Thank you Mary Ann that was very helpful!